Reference number for this case: 8-oct-54-Schwoben. Thank you for including this reference number in any correspondence with me regarding this case. "I felt the breath of the "saucer" which passed above me"
[Captioned picture:] "The machine was this close from the ground," states Mr. Ott by accompanying his words by hand indication. More perhaps that the emotion, fright was still readable on his face, when, for the fifteenth time, Mr. Rene Ott repeated yesterday morning the amazing adventure of which he had just been the witness. What happened to him? Well, a thing altogether extremely banal for some time: he had seen a "flying saucer. Extremely ordinary in truth, for hardly days go by any more without one announcing under all the latitudes the presence of these machines. But what is much less ordinary, are the circumstances in which Mr. Ott was put. For this time the first saucer landed - or almost landed (to 50 cm near) -- in a field of the Sundgau. And that is understandable: according to the testimony of Mr. Ott, the machine was not directly posed on the ground, but stood motionless at approximately 50 cm above the latter. It had the shape of a "mushroom" or of a hut, was approximately 3 meters long, was rounded at the top like a cupola, in the middle of which was a door opened towards the interior of a height of 1 m 50 and broad of 60 cm approximately. Needless to add that everyone at the SNCF [national railway co] district, bld du Chemin de Fer in Mulhouse listened with interest - and more or less skepticism - to the adventure which had just lived, yesterday morning, René, the office boy. Mr. Rene OTT, 35 years old, domiciled in Berentzwiller, is a civil servant, considered serious, his chiefs confirmed it to us. It is unthinkable that he invented this adventure and the emotion which still held him was not pretended. In short, curiosity prevailed and his chiefs, two inspectors of the SNCF, decided to bring back on the spot our man so that he explained in detail what he had seen. Here is verbatim what he stated. Instinctively, I put the headlight of my scooter in low mode. At the moment when it me exceeded me I clearly felt the breath of the machine. It then preceded me, always at the same distance and the same height and this, on several hundreds of meters, to the first house of Jettingen. There, I stopped, feeling more reassured. It is at this time that the "luminous mushroom" went up vertically and an unbelievable speed behind the first houses of Jettingen to quickly disappear in the sky. It made absolutely no noise, at least, I did not hear anything, owing to the fact that the engine of my scooter was running and that I wore a helmet. At no time have I seen men or living beings around or in the machine, not even moving shadows. The mushroom was opaque when it was on the side of the road and completely luminous, even blinding, when it preceded me at 6 m from the ground". Such are the statements made by Mr. René Ott to the investigators who could absolutely not a thing which could deny of confirm them, for the moment. We have, as for us, the feeling that the report by Mr. Ott was sincere and that in any event one can grant credit to his statements. It is not excluded that in two or three days from now, Mr. Ott remembers this or that detail which could have a cardinal importance. Anyway, nobody could find the least contradiction in this testimony which corroborates as a whole all those already provided on the saucers: total silence, high speed, dazzling multicolored lights. Here thus one more testimony to pour into the bulky file of the saucers whose mystery - is necessary it to say alas or so much better - remains nevertheless whole. 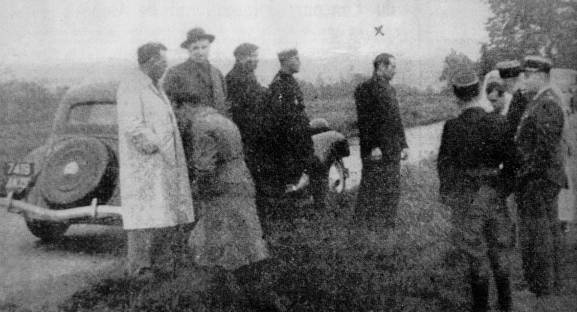 [Photo caption:] Mr. Ott (indicated by a cross) shows to the representatives of the railroad company and public authorities the place, at the edge of the road, where he saw the saucer hovering sixty centimeters above ground-level. An employee of the railway, René Ott, saw a mushroom-shaped object, 3 meters in diameter, in a field, three meters away from national road 16 and hovering 1 meter above the ground. A luminous rectangle, looking like a kind of doortrap, was seen on the side. The object raised and went 5 meters above the observer's head, following him until the witness reached the nearby village. The author indicates that the newspaper "L'Alsace" for October 9, 1954 reports "an interesting observation made the day before, close to Berentzwiller, is a S.N.C.F. civil servant considered serious, his chiefs confirmed it to us." Jimmy Guieu states that it is unthinkable that he invented this observation and that the emotion which still grabbed him is not falsified. "It was about 05:30 in the morning and I had just left my home in Berentzwiller to go, like every morning, in Altkirch where I take the train for Mulhouse. I drove by scooter when at the exit of the village towards Jettingen, approximately 3 meters from the road D16, in a meadow, I clearly saw, in the beam of my headlight, a craft in the shape of a mushroom or a hut. It was approximately three meters high and three meters long and was rounded at the top like a cupola in the middle of which was an opened door, opened to the inside, of a height of 1 m 50 and 60 centimeters large approximately." "I was seized by fright and accelerated, but I hardly drove fifty meters when I was taken, from behind, in the beam of a powerful headlight whose white light lit a good 200 meters. A few seconds later, I suddenly saw in front of me, approximately three away meters, and six meters height above the road, a craft of conical shape whose rainbow gleams dazzled me and lit as in broad daylight. Instinctively I put the headlight of my scooter in low mode. At the time when it passed me by, I clearly felt the blow of the craft. It preceded me then, to the first house of Jettingen. " "There, I stopped, feeling more reassured. It is at this time that the luminous "mushroom" went up vertically at an incredible speed behind the first houses of Jettingen to disappear quickly in the sky. It did not make any noise at all, at least I did not hear anything owing to the fact that the engine of my scooter was on and that I wore a helmet. At no time did I saw men or living beings around or inside the craft, not even moving shades. The "mushroom" was opaque when it was near the roadside, and completely luminous, even dazzling, as soon as it preceded me six meters above the ground." "I was riding my scooter between Berentzwiller and Altkirch on the secondary road 16, when a little before the village of Jettingen, I clearly saw in the ray of my headlight, at about 3 meters of the road on the left, in a meadow, a machine in the shape of a mushroom or a hut. It could be measuring 3 meters in span, and in his silhouette in the shape of cupola I distinguished a luminous rectangle, like a door, of a height of 1.50 meter and broad of 60 centimeters approximately. Seized be fear, I accelerated. But a few tens of meters further, I was taken by behind in an intense white light increasing to at least 200 meters, and whose source seemed to approach very fast. The machine indeed exceeded me at a height of 5 or 6 meters above the road, and I very clearly felt a very strong air volume displacement. It then preceded me above me by the road to the village, during several hundreds of meters. At the first house, it went up almost vertically and disappeared behind the village. But I had the time to observe it. It was extremely luminous in flight, with gleams of rainbow. I did not understand anything, but on the other end I was wearing a helmet." Michel Carrouges reports that René Ott, aged 35, employee of S.N.C.F. (the national railroad company), travelling by scooter on October 8, 1954, at 05:30 a.m. on a road near Jettingen in the department of the Haut-Rhin, suddenly saw in the light of his headlight, within 3 meters of the road in a nearby meadow, a kind of large "mushroom" with an hemispherical cupola, of aluminum color. He also noticed a luminous rectangular cut out like a door, in the cupola. Frightened, he accelerated, but a few tens of meters further, he is caught in an intense white light which seemed to chase him. The craft caught up with him, flew above him at a height from 5 to 6 meters above the road, exceeded him during several hundreds of meters up to the village of Jettingen, where it flew away almost vertically. "I was riding a motor scooter along Route D-16, between Beeantzwiller [sic] and Altkirch, when just this side of the village of Jettingen I saw in my headlight, very clearly, an object in the meadow to the left of the road, only nine or ten feet away. It was shaped like the top of a mushroom, or a low hut, and it might have been ten feet from tip to tip. In the cupola-shaped silhouette I could see a lighted rectangle, like a door, about four and half feet high by two feet wide." "The thing frightened me and I speeded up. But maybe 60 feet farther along, I was caught in a fierce white light from behind me, that shone at least 200 yards ahead and that seemed to be coming closer at terrific speed. In fact, the machine or whatever it was passed over my head no more than 15 or 20 feet above the road, and I distinctly felt a very strong current of air." The author indicates that on October 7, 1954, in Jettingen in the Haut-Rhin, a railwayman saw an object in a field, within 3 meters of the road and 1 meter above ground-level. It had the shape of a mushroom of approximately 3 meters in diameter. A luminous rectangle, like a door opening, was observed on one of the sides. It took off and flew at approximately 5 meters above the witness, following him to the village. Charles Garreau mentions that there was an observation on 7 October 1954 in Mulhouse. The two authors and ufologists report on the case of Schwoben in the Haut-Rhin, on October 8, 1954, at 05:35, indicating that the references are personal files and newspaper clipping. They report that Mr. Ott, an S.N.C.F employee [Société National des Chemin de Fer is France's state railway service], resident of Berentzwiller, left his home to go to the station of Altkirch. At the exit of Jettingen, in a field, on the side of the road, he sees a strange object thanks to the light of his headlight. "It had the shape of a mushroom, or a hut. It was a kind of semi-spherical cupola, approximately 3 meters in diameter. It seemed to me that I distinguished a door or an enlightened trap door from the interior. I became frightened. I made a full-turn. But I had not made 50 meters that I was in the beam of a powerful projector. A few seconds later, I was overflown by a machine which flew at 5 or 6 meters above the road. It was conical, with rainbow gleams, which lit as in full day, and which dazzled me. Instinctively, I put the headlight of my scooter in code. When the machine buzzed me, I clearly felt a flow of air. It preceded me while maintaining the same distance and the same height, to the first houses of Jettingen, i.e. during 800 meters approximately. There, I stopped. I was a bit reassured. The machine then rose vertically, at a fantastic speed. I quickly lost it from sight." Oct. 07, 1954, dawn, Jettingen (France). A railroad employee, Rene Ott, saw a mushroom-shaped object 3 m in diameter, in a field 3 m away from Route N16 and 1 m above ground. A luminous rectangle, like a door, was seen on the side. It took off and flew about 5 m above the witness, following him to the next village. (41; M 143) (France-Soir, 10 October 1954). The two authors indicate that on October 8, 1954 at 05:35, in Jettingen, in the department of Haut-Rhin, the witness left his residence in Berentzwiller, to go to his work by scooter, at the railway station of Altkirch. Right before entering in Jettingen, he sees, in a field, within 3 meters of the road, and at approximately 1 meter above ground-level, an object in the shape of a mushroom, like a half-spherical cupola, approximately 3 m in diameter, a door or a trapdoor illuminated from within is visible on the side of the apparatus. It could have had a height of 1 m 50 and a width of 1 m 60 cm. Seized by fear, the witness accelerates (A. Michel), or made a U-turn (Garreau). He is then taken in an intense light, from behind, light which illuminates at 200 meters, and whose source seems to approach at full speed. The witness is exceeded by the machine which flies at approximately 5 to 6 meters of altitude, and is preceded by this one during a few hundreds of meters, to the village of Jettingen. At the first houses, it goes up vertically and disappears behind the village in the direction to Altkirch. The authors indicate that the sources are case 206 of the Vallée Catalogue with the date October 7, 1954; Charles Garreau and Raymond Lavier in "Face aux ET" pages 110-111 with the date October 8, 1954; Jimmy Guieu in "Black-out sur les S.V. pages 202-203 with the date October 8, 1954; Quincy with the date 8 October 1954; Aimé Michel in "A propos des S.V." pages 181 with the date October 7, 1954; and L'Alsace for October 9, 1954 indicating it occurred the previous day thus on October 8, 1954. Speeding along on Rt N16 near Jettingen on his motor scooter, M. Rene Ott passed a field where a mushroom-shaped object was hover just above the ground. Visible on the side of the nine foot wide object was a luminous rectangle(a door?0. M. Ott raced away on his scooter but the object took up the chase, the UFO flying just above the scooter(15 feet or so) and staying in that position until the nearest town was reached. 66. Jean Sider indicates that on October 8, 1954, at 05:35, in Jettingen, France, René Ott, then aged 35, drove on a scooter and sees in a field, 3 meters from the road, an object approximately 3 meters in diameter, mushroom shaped. He is frightened, made a half-turn, and is suddenly taken in an intense light from behind, whose source approaches more and more. He is passed by the flying object at 5 or 6 meters of altitude and feels at its passage an effect of air volume displacement. Jean Sider indicates that the source is Michel, pages 180,181. The Belgian ufologist indicates in her chronology that in 1954, on October 7, in France, in Jettingen, at dawn, at 05:35, Rene Ott, SNCF employee, saw an object having the shape of a mushroom 3 m in diameter in a field at 3 m from the road and 1 m of the ground. It took off and rose at approximately 5 m above the witness, following him to the nearby village. Godelieve van Overmeire indicates that the sources are "France-Soir, 10 oct 1954; Jacques Vallée: "Chronique des apparitions ET" - DENOEL 1972 - J'AI LU COLL. - p. 270, 271 which dates October 8) H also notes a luminous rectangle cut like a door in the cupola. Frightened he accelerates but several dozens of meters further he is taken in an intense white light that seemed to chase him. the craft catches up with him, flies over him at 5 or 6m above the road, flies in front of him like that on several hundred meters until the village of Jettingen there it flies away almost vertically. ; Michel Carrouges: "Les apparitions de Martiens" pub. Fayard, 1963, p. 91". 1954 October 8 - Jettingen, France. A railroad employee, Rene Ott, saw a mushroom-shaped object three meters in diameter, in a field three meters away from Route N16 and one meter above the ground. A luminous rectangle, like a door, was seen on the side. It took off and flew about five meters over the head of the witness, following him to the next village. (Sources: Aime Michel, Flying Saucers and the Straight Line Mystery, p. 143; Jacques Vallee, Passport to Magonia, p. 219). At twilight in Jettingen (France), Rene Ott (railroad employee) sees an object of the form of a mushroom 3 m in diameter, in a field at 3 m from the N16 and 1 m of the ground. A luminous rectangle, a kind of door, is seen on the side. It takes off and rose to approximately 5 m above the witness, following him to the nearby village. Christian Valentin indicates among the many observations in Alsace in 1954, that on October 8, quoting from the newspaper l'Alsace for October 9, 1954. He indicates that Rene Ott was aged 35, that he was an office clerk at SNCF, France's National Railway company, that he lived in Berentzwiller and was, according to the journalists of L'Alsace, "a civil servant considered serious, his chiefs confirmed it to us. It is impossible that it invented this adventure, and the emotion which still gripped him was not made-up." "It was about 5:30 in the morning and I had just left my residence in Berentzwiller, to return like each morning in Altkirch where I took the train for Mulhouse; I drove by scooter when at this precise spot, at the exit of the village, towards Jettingen, at approximately 3 meters on the left of the road, in a meadow, I clearly saw in a ray of my headlight a machine in the shape of a mushroom, in the middle of which a door was opened... I was seized by fright and accelerated, but I had not made 50 meters that I was taken, from behind, in the beam of a powerful headlight, whose white light ranged well 200 meters. A few seconds later, I suddenly stand in front of me, approximately 3 away m and 6 m height above the road, a machine of conical shape whose rainbow gleams dazzled me and lit as in broad daylight... Instinctively, I put the headlights of my scooter in low mode... At the time when it exceeded me, I clearly felt the breath of the machine. It then preceded me, always at the same distance and the same height, and this on several hundreds of meters, to the first house of Jettingen." "There, I stopped, feeling more reassured. It is at this time that the luminous mushroom went up vertically and at an incredible speed behind the first houses of Jettingen, to quickly disappear in the sky. It made absolutely no noise, at least I did not hear anything owing to the fact that the engine of my scooter was running and that I wore a helmet." "At no time I saw men or living beings around the machine or inside, not even moving shadows. The mushroom was opaque when it was beside the road, and completely luminous, even blinding, when it preceded me within 6 meters above the ground." On October 08 takes place the first close encounter in Jettingen. At 05:30 of the morning, the witness observes in a meadow a machine in the shape of a mushroom in the center of which a door was opened, the witness seized ny panic leaves the place with his Mobylette, and was caught up by the craft. The witness: "I have feld [sic] the breath of the saucer which had just passed me"
Luc Chastan indicates that in the Haut-Rhin in Jettingen on October 8, 1954 at 05:35 hours, "the witness had just left his home in Barentzwiller, to go, by scooter, to his work, at the train station of Altkirch. Right before entering in Jettingen, he sees, in a field, 3 meters from the road, and approximately 1 meter above ground-level, an object in the shape of a mushroom, like a half-spherical cupola, approximately 3 m in diameter, a door or a trapdoor enlightened from the inside is visible on the side of the apparatus. It can have a height of 1 m 50 and a width of 60 cm. Frightened, the witness accelerates (A. Michel), or make a half-turn (Garreau). He is then taken in an intense light, from behind, a light which lits on 200 meters, and which source seems to approach at high speed. The witness is passed by by the craft which flies at approximately 5 to 6 meters of altitude, and is preceded by the latter during a few hundreds of meters, to the village of Jettingen. At the first houses, it goes up vertically and disappears behind the village in the direction of Altkirch. The website indicates that on 7 October 1954 at 06:00, in Jettingen, France, a railroad employee, Rene Ott, saw a mushroom-shaped object three meters in diameter, in a field three meters away from Route N16 and one meter above ground. A luminous rectangle, like a door, was seen on the side. It took off and flew about five meters above the witness, following him to the next village. 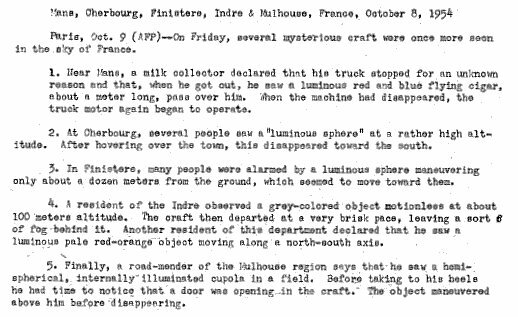 The website indicates that on 8 October 1954 at 05:30 in Jettingen, France, a motorcyclist "saw mushroom-shaped object, 10 feet wide, with open door 2'x5'. Saw no occupant. After driving past was struck by a powerful beam of light. An object was observed. Gravity effects were noted. One domed disc, about 10 feet across, was observed by one experienced male witness on a farm (Ott, R)." The sources are indicated as Webb, David, HUMCAT: Catalogue of Humanoid Reports; Michel, Aime, Flying Saucers and the Straight-Line Mystery, S. G. Phillips, New York, 1958; Bowen, Charles, The Humanoids: FSR Special Edition No. 1, FSR, London, 1966; Vallee, Jacques, Computerized Catalog (N = 3073); Vallee, Jacques, Challenge to Science: The UFO Enigma, Henry Regnery, Chicago, 1966; Vallee, Jacques, Preliminary Catalog (N = 500), (in JVallee01); Vallee, Jacques, A Century of Landings (N = 923), (in JVallee04), Chicago, 1969; Cramp, Leonard G., Piece for a Jig-Saw, Somerton, Isle of Wight, 1966; Schoenherr, Luis, Computerized Catalog (N = 3173); Newspaper Clippings; Hatch, Larry, *U* computer database, Author, Redwood City, 2002. The authors indicate that on October 8, 1954 in Jettingen in the Haut-Rhin, Rene Ott drove by scooter on a countryside road at approximately 5:30 a.m. when he spotted in a field within three meters of the road an object in the shape of a mushroom approximately three meters in diameter, where one distinguished an enlightened door from 1.50 meters by 60 centimeters. The witness prudently made a half turn and suddenly he was caught in an intense light, before being exceeded by the flying object at 5 or 6 meters of altitude, and feeling at its passage an effect of air volume displacement. The authors indicate that the source is Jean Sider in "La Vague de 1954 et l'Imposture Rationaliste". *Oct. 7, 1954 - Jettingen, France. At dawn a railroad employee, Rene Ott, saw a mushroom-shaped object three meters in diameter, in a field three meters away from Route N16 and one meter above the ground. A luminous rectangle, like a door, was seen on the side. It took off and flew about five meters over the head of the witness, following him to the next village. (Sources: Aime Michel, Flying Saucers and the Straight Line Mystery, p. 143; Jacques Vallee, Passport to Magonia: A Century of Landings, p. 219, case # 206). René Ott (under the checkmark) indicating the location of his encounter to the Gendarmes and two agents of the Renseignements Généraux, the French intelligence. It so happens that the assertions of the two pranksters - journalists of Samedi-Soir offer at least one proof that they invented at least one of their mystifications; this is casting further doubt on the whole of their claims. As a matter of fact, they claim that they were the pranksters that fooled Mr. Ott, in Toulouse. However, if Toulouse was indeed on their claimed route, the observation of Mr. Ott by no means took place in Toulouse in the South but in Mulhouse, in the East, in Alsace, almost at the other end of France! [la1] Article in the regional newspaper L'Alsace, Mulhouse, France, October 9, 1954. [fs1] Article in the national newspaper France-Soir, Paris, France, October 10, 1954. [jg1] "Black-Out sur les Soucoupes Volantes", book by Jimmy Guieu, Fleuve Noir publisher, France, pp 202-203, 1956. [am1] "Flying Saucers and the Straight-Line Mystery", book by Aimé Michel, English version of "Mystérieux Objets Célestes", S. G. Phillips publisher, USA, page 143, 1958. [mc1] "Les Apparitions de Martiens", book by Michel Carrouges, (aka Louis Couturier), Fayard publisher, France, page 91, 1963. [lc1] "Piece for a Jig-Saw", book by Leonard G. Cramp, Somerton publisher, U-K., 1966. [jv2] Summary by Jacques Vallée in "En Quête des Humanoïdes", book by Charles Bowen, French translation of "The Humanoids", J'ai Lu publisher, France, page 44, 1974. [gl1] "Face Aux Extra-Terrestres", book by Charles Garreau and Raymond Lavier, Delarge publisher, France, pp 110-111, 1975. [jg1] "Black-Out sur les Soucoupes Volantes", book by Jimmy Guieu, Omnium Littéraire publisher, France, pp 202-203, 1972. [am1] "Mystérieux Objets Célestes", book by Aimé Michel, Seghers publisher, France, pp 197-198, 1976. [ga1] * "Les Soucoupes Volantes: le Grand Refus? ", collective book by the G.A.B.R.I.E.L. group, Michel Moutet publisher, France, page 38, 1978. [fr1] "OVNI, Premier Dossier Complet des Rencontres Rapprochées en France", book by Michel Figuet and Jean Louis Ruchon, Alain Lefeuvre publisher, France, page 134, 1979. [gc1] "UFOs and Anti-Gravity: Piece for a Jigsaw", book by Leonard G. Cramp, Adventures Unlimited Press publishers, U-K., pp 127-128, 1997. [js1] "Le Dossier 1954 et l'Imposture Rationaliste", book by Jean Sider, Ramuel publisher, France, page 1248, 1997. [dj1] UFOCAT's "On this day" web page, by Donald A. Johnson, Ph.D., compiled from the UFOCAT 2003 computer database, www.ufocat.com/on_this_day/October08.html. [cv1] "1954, l'Année des OVNIS - Des Observations par Dizaines, des Témoins par Centaines", article by Christian Valentin in "Saisons d'Alsace", quarterly magazine, Dernières Nouvelles d'Alsace publisher, Strasbourg, France, pp 90-91, summer 2004. [sp6] * "Il y a cinquante ans - Les Ovnis en Alsace", article by the Alsatian ufology association SPICA, in the UFOmania ufology magazine, Didier Gomez publisher, France, #41, Fall 2004. [ki1] "Ce Qu'ils Ont Vu à l'Intérieur des Soucoupes Volantes", book by Daniel and Fabrice Kircher, Le Temps Présent publisher, France, page 75, 2008. 0.1 Patrick Gross April 5, 2005 First published. 1.0 Patrick Gross January 26, 2009 Conversion from HTML to XHTML Strict. First formal version. Additions [lc1], [go1], [js1], [jb1], [lc1], [ud1], [ud2]. 1.2 Patrick Gross June 4, 2010 [la1] article, previously incomplete, is now complete. 1.3 Patrick Gross June 25, 2010 Addition [af1]. 1.5 Patrick Gross July 7, 2010 Addition [cg1]. 1.7 Patrick Gross January 25, 2014 Addition [fs1]. 1.8 Patrick Gross October 7, 2014 Addition [ni1]. 3.0 Patrick Gross May 11, 2015 Addition [sp4]. 3.1 Patrick Gross August 28, 2015 Addition [ga1]. 3.2 Patrick Gross October 25, 2016 Addition [sp6]. 3.3 Patrick Gross December 18, 2016 Additions [lg1], [ub1]. 3.4 Patrick Gross January 23, 2017 Additions [ll1].